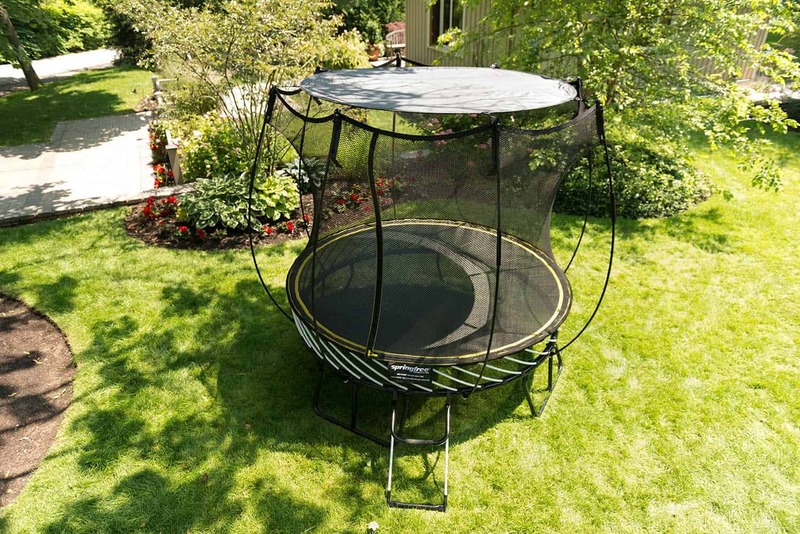 Prices vary by Trampoline Size - Call 813-875-5500 to place your order. • Ideal for small children and non-jumping activities such as chalk play, reading, playing with toys etc. • Sizes: There is a different size Sunshade for whichever size Springfree Trampoline you have. • Storage: Ships in a reusable storage bag. Bag can be reused when sunshade is not in use. • FlexrHoop and tgoma Tablet Holder can be left with the Sunshade. • tgoma can be played with the Sunshade in place. • For general jumping the shade can remain in place for smaller jumpers. Taller jumpers may come into contact with the shade. However, the shade is soft and will not cause injury. • The Sunshade is NOT weight bearing – it should be cleared of any falling debris (twigs, leaves, etc) or during periods of in climate weather such as snow or heavy rain/hail. • The Sunshade should be removed during periods of high winds, as it may detach from the trampoline or act as a sail. • Note: All Sunshades are the same shape (circles) but vary in diameter to fit the shapes/sizes of the trampolines.